Vadodara: Prime Minister Narendra Modi, addressing a public rally at Vadodara in Gujarat, asked his predecessor Manmohan Singh why did he not show the courage to order a surgical strike post the 26/11 Mumbai terror attack, despite the readiness of the Army. He said after the Mumbai attacks, the Air Force had approached the then prime minister Singh with a plan for surgical strikes, but the government did not show the courage to order it. “Under whose advice did he (Singh) do so,” Modi asked the gathering at the Navlakhi compound at Vadodara. “Someone who served at a high position in the Air Force has said that after 26/11, they went to the then prime minister with a plan for surgical strikes. Sadly, the then government did not show the courage to do that,” Modi said and cited the example of his government’s action in the aftermath of the Uri terror attack in September last year. “My government, in the aftermath of the Uri attack by Pakistan, had launched a surgical strike inside the borders of Pakistan, targeting several terror camps and launchpads. The strikes came as a surprise for the Pakistanis who were caught unaware. While the maximum damage was inflicted on their side, the Indian soldiers came back without any casualties,” he added. Modi also questioned Congress leaders, including its vice president Rahul Gandhi, for raising doubts over the surgical strikes. “Are such secret matters to be discussed in public?” he asked, saying this was the difference between the NDA government and the UPA government. 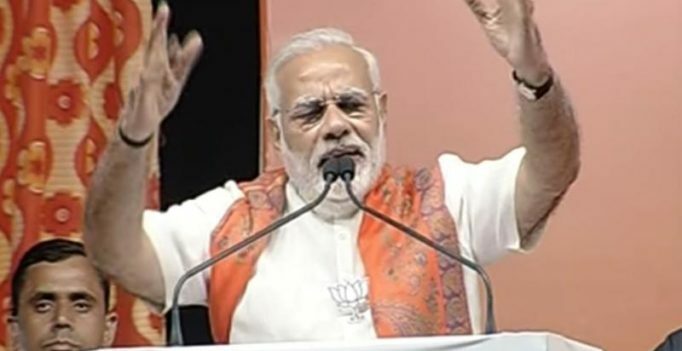 Modi said the reason behind his vacating the Vadodara Lok Sabha seat in 2014 was for blossoming the “lotus” in Uttar Pradesh and replicating the Gujarat model of development in that state. After winning two Lok Sabha seats from Vadodara and Varanasi in the 2014 general election, Modi had retained the Varanasi seat. He thanked the people of Vadodara for allowing him to resign from here. The Prime Minister also justified demonetisation, saying it was aimed at unearthing black money and preventing the parallel economy. He said the government had since succeeded in unearthing a “hawala” racket in Jammu and Kashmir which led to the arrest of many leaders who were advocating support for terrorism in the state. Congress leaders were not happy with demonetisation as it was a source of their income and even after a year since the note ban, they had kept the issue alive, he said. The Prime Minister also wondered how a “secret meeting” between Congress leader Mani Shankar Aiyar and the former Pakistani high commissioner and other leaders from that country could take place without the knowledge of the Government of India. Modi said when he was the chief minister of Gujarat, he used to take permission from the Manmohan Singh-led UPA government at the Centre before holding a meeting with a foreign dignitary. Indian businessman owns 22 apartments in Dubai's tallest tower Burj Khalifa!